Less than a year after the launch of the Carrera Heuer 01 in-house chronograph, the new generation of Carrera incorporates a chrono plus a flying tourbillon. The Carrera Heuer 02-T is entirely designed, developed and produced at the Manufacture TAG Heuer. For the Black Phantom model, the new Carrera case, made from 12 separate modular parts, is fashioned from black titanium. It houses the very latest TAG Heuer calibre, the Heuer-02T. This chronograph movement is directly inspired by the CH-80 and is COSC-certified. 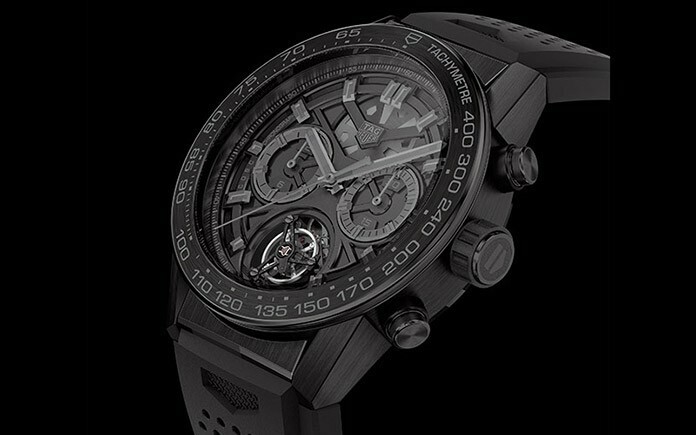 Here, it combines with a tourbillon regulator that stands out for its black and grey design, its lightness thanks to the use of titanium and carbon, and its flying construction. This new timepiece naturally shares the skeletonised, sleek, contemporary design of the new generation of Carrera watches, with its skeleton bridges, openworked hour circle and geometric bridges. The Carrera Heuer-02T Black Phantom is a 250-piece edition and positioned, amazingly, at under CHF 20,000. 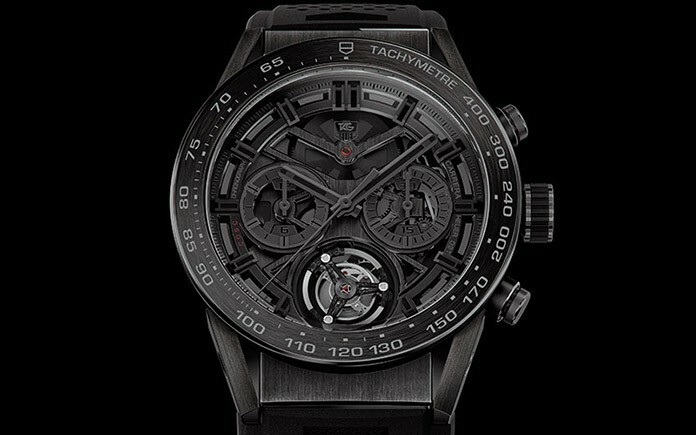 Movement: Mechanical automatic, COSC-certified HEUER-02T calibre, flying tourbillon with titanium and carbon cage, 28,800 vib/h, skeletonised bridges, power reserve in excess of 65 hours. Functions: Hours, minutes, seconds on the tourbillon, date, chronograph, tachymeter. Grade 5 black titanium, 45 mm. Sapphire crystal front and back. Water-resistant to 100 metres (10 bar/330 ft). Black hands, hour-markers and counters, 30-minute counter at 3 o’clock, 12-hour counter at 9 o’clock. Bracelet/Strap: Mat black alligator on black rubber, titanium folding clasp. Other versions: Grade 5 titanium case and black titanium bezel with skeleton dial, silver hands and counters.